Perhaps my favorite way to have pork is like this, grilled and rubbed with dijon mustard and a rosemary/garlic concoction. It was the first way I had cooked pork in out of my Dutch tradition and has been one of my favorites. Its simple and the combination of the flavor of pork, rosemary and dijon are always a win. So in typical fashion in getting ready to put this on the blog I made the pork, tried to stage it nicely and took a bunch of pictures. Then in my moment of brilliance I decided I needed to organize the pictures before writing this post. There in lies the problem…I deleted them having thought they were copied off somewhere else. So you will have to take my word for it the pictures were something to behold, they did the meat such justice. So without further ado and before I lose the recipe with the pictures here it is. Several hours before grilling time, mix all ingredients except pork loin and dijon. Then you have a choice to make either flatten the loin by cutting into it the long way while rotating it to come out with one large and consistently thick piece of pork, like a piece of rolled out dough or just use it whole, both ways are superb. Rub entire piece of meat with dijon and then the rub the entire piece of meat with the rub made above. If you did not flatten the meat you can simply wrap it in saran wrap and throw it back in the fridge tell you are ready to cook it. If you did flatten it you will not need to roll it back up, like a long line of cinnamon rolls and then proceed to wrap it in saran wrap and toss it in the fridge tell cook time. Once cook time comes around, prepare the grill for indirect cooking. With charcoal like below or with gas preheat the grill with both burners and turn the one you will be cooking over off. For gas grills place the loin on a grill rack over a drip pan. 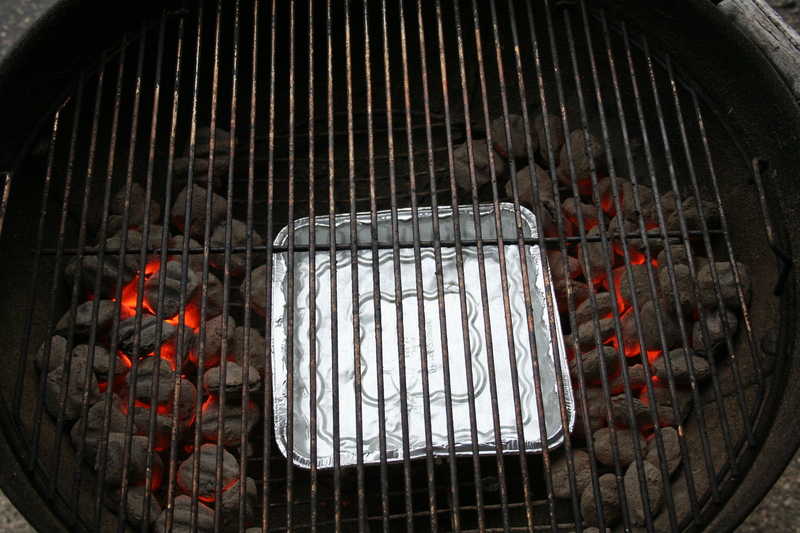 For charcoal you will have a drip pan filled with water in the center of the grill with charcoal on either side. Just toss the meat on the pre lubricated grate being sure if you flattened and rolled the meat it does not come unrolled. Cook indirectly until the center of the loin reaches you desired done-ness. I pulled mine at 148ºF and let it rest for 10 minutes before slicing into it. Cooking indirectly over charcoal is easy and quite rewarding. Just prepare a normal amount of charcoal for your grill using a chimney or other method. Fill a foil pan with boiling water and place it in the center of the grill and tuck the charcoal on opposing sides of the pan. Be sure to add a half dozen briquettes every 45 minutes or so to keep a consistent fire. You can also toss on a chunk or two of wood to give it a little smoke flavor. You will notice that the openings on my grill grate are strategically positioned over my charcoal pockets, this allows for easy replenishment.